Get out your Palm Pilots and Seinfeld DVDs—it’s time to start appreciating the 1990s. Time travelers can start their pre-Millennial studies by visiting the Skyscraper Museum’s new exhibition, Millennium: Lower Manhattan in the 1990s. The show, which runs through April, explores civic plans, architectural schemes, and urban legislation that proliferated in this time of simultaneous optimism and anxiety for Manhattan's southern tip. As the Financial District recovered from recession, and reckoned with a building stock and location that were becoming less desirable, the area was in need of new ideas and policies to enact them. In the museum’s mirrored galleries visitors come face to face with urban prescriptions, some successful, some not. Those that came to be included the J.M. Kaplan Foundation's Heritage Trails, walking tours guided by colorful signpost sharing the stories and significance of local buildings and sites. Most no longer stand, but thanks to the museum, you can now view them all online. 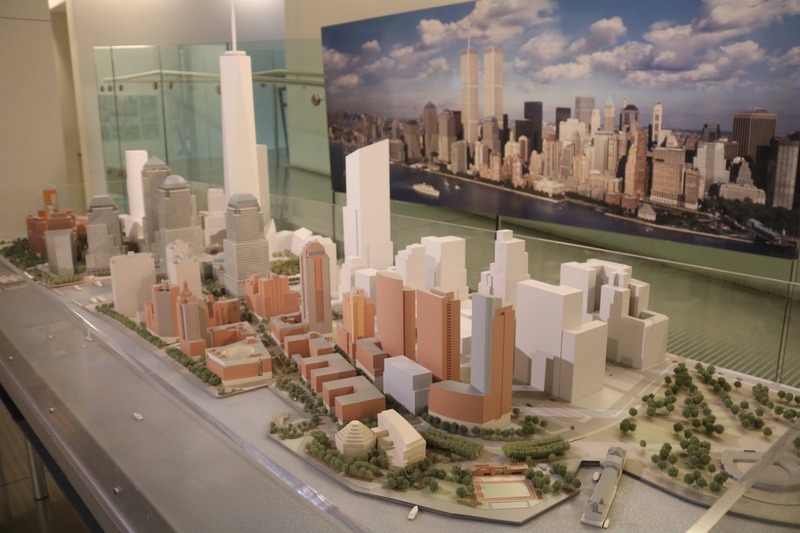 There's also a massive model of Battery Park City, which added half a dozen buildings as well as significant new public space—like Machado Silvetti’s Wagner Park. Failed plans included SOM’s proposal for a revamped New York Stock Exchange, with a 51-story office building above, and Smith-Miller+Hawkinson’s Museum of Women—The Leadership Center, a nine-story institution just up the block from the Skyscraper Museum. Visitors should also take a look at James Sanders + Associates project for Liberty Plaza, now Zuccotti Park. Commissioned by Heritage Trails New York, the scheme was intended to inject the frenetic activity of the area's financial markets into its relatively sleepy urbanscape, with undulating stock tickers, interactive charts, full color LCD TV displays (a new technology at the time), learning kiosks, and even a beacon sending a beam of light high into the air; an early precursor to the Tribute in Light. The show methodically pinpoints other vital 1990s benchmarks: the crafting of a new neighborhood plan, the landmarking of dozens of buildings, the establishment of the Downtown Alliance, the first bombing of the World Trade Center (1994), the founding of the Skyscraper Museum itself, and the birth of a residential boom in the area thanks to residential conversions and financial incentives. It clearly paints a picture of how pivotal this period was in establishing contemporary New York, and how radically the area, and the country have changed since, as downtown has—for better and worse—morphed under the effects of global capital, real estate, and terrorism perhaps more profoundly than anywhere in the world. When Smith-Miller + Hawkinson was brought in to design a new, Landmarks-worthy facade for 25 Great Jones Street, a 13-story sliver of concrete and steel in Noho, some people complained that the architect's proposal remained too modern, even despite such genre-bending neighbors as 40 Bond Street. Regardless of such complaints, the LPC approved the new facade a few weeks ago, and as if to prove the doubters wrong, the designers have installed a mock-up on site. "In the context of the neighborhood I think it works perfectly—and curiously familiar in scale and coloring to the cornice ornament of the building adjacent to the East," Henry Smith-Miller said, adding with a chuckle: "It's dark, brooding, and tangley. The jungle is coming. Watch out for King Kong." To see what he's talking about, check out the mock-ups after the jump. Thanks for your e-mail, I'd say there is no infringement here just bad manners and questionable design. After several years of hard work with Axel Stawski and his partner Tony Leichter, we had a project endorsed by Landmarks and City Planning and ready to permit. At the completion of our work, Mr. Stawski determined that he needed bigger units and a less expensive building exterior. We parted amicably, Axel then spoke with Thom Mayne [Ed. : Thom Mayne!] who passed on the project, and then he turned to KPF, who have built some of the best new buildings in the city. KPF has set a very high standard for design excellence all over the world, and I was surprised to see their attempt to build in SoHo. 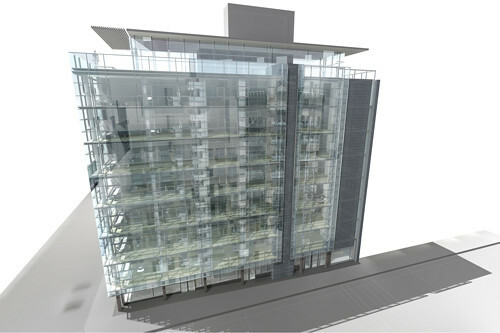 Their design, although similar in massing to our proposal, is radically different in its appearance. Taking a cue from the Nouvel's extraordinary exterior design at 40 Mercer, KPF has brought the window mullions forward of the full height operable glazing and "protected" the opening with juliet balcony front. I guess the NYC Landmarks Preservation Commission will have to judge the new proposal based on its merit and not on what we had proposed. For the record, we had proposed an intentionally, and completely flat, structurally glazed and reflective water white glazed skin (with parallel projected window sash) that "wrapped" the corner of the building in a configuration very similar to the typical cast iron neo-classical applique found on many of SoHo's buildings. Our mullion system was behind the glass skin and there were no balconies, our proposal was about skin and surface, reflection and lightness. All that hard work for naught. And now, courtesy of 27 Wooster's very own blog, a picture of a board of a rendering of the KPF design. UPDATE: The 27 Wooster blog posted some new renderings last night, plus a rundown of neighborhood buildings against the new one. I wonder where they stand on the issue. Still, given recent trends in and around the neighborhood, we'd argue it's a pretty close fit.